Protecting the health of our skin is vital for long term well being, but having a sun kissed tan is also a must for the warmer months. Jergens Natural Glow Face Daily Moisturizer is an easy way to get the best of both worlds! This facial moisturizer contains SPF 20 and features a one-of-a-kind formula that protects your skin from the sun, while still giving you the same gorgeous glow as a sun tan. The results allow you to safely achieve a gradual color with each wear! 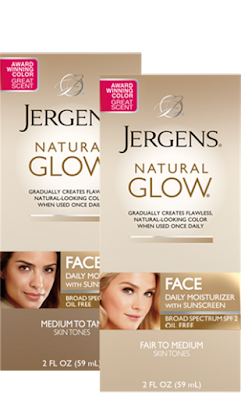 JERGENS Natural Glow FACE Daily Moisturizer ($6.99) gradually creates fabulous, natural-looking color with a subtle skin darkening complex. Specially formulated for your face. This advanced formula contains SPF 20 to help defend against the effects of everyday sun exposure.